If you’ve been looking for a stylish way to serve your homebrew, you will love this single faucet beer tower for the fit, finish, and value. 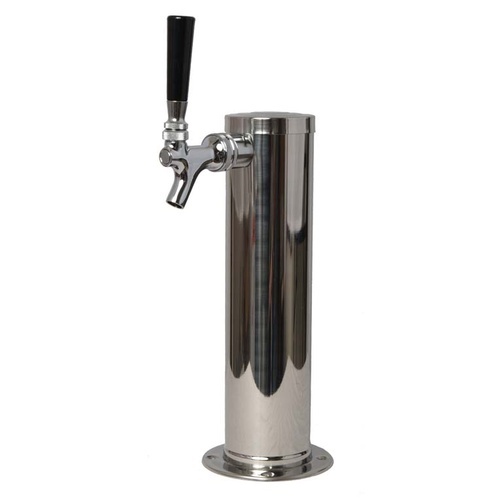 This draft beer tower includes 4' of 3/16" ID beer line and tail piece/hex nut for connection to commercial sanke style keg. If you are a homebrewer using Cornelius style kegs you can cut off the Sanke fittings and attach the appropriate fittings for your kegs. This tower is a much heavier gauge than what came on my Kegulator originally. The only downside is that it does not have a collar to go over the screw mounts on the base. They do provide chrome Phillips head screws for mounting that would probably look good. Unfortunately they are fairly short and you may need to use other bolts to fasten it to your countertop or refrigerator top. The hose from the tap to the keg does not have a connector. Be sure you get this as an additional item when you order this product.